Industry Experts released an updated 2017 version of the global market research report on Monolithic Ceramics. As per the new version entitled ‘Monolithic Ceramics – A Global Market Overview’, Electrical & Electronic Components is estimated the largest application sector with US$26.3 billion in 2017 and also projected to be the fastest growing market during the analysis period 2017-2022 with a CAGR of 5.7%. Asia-Pacific is estimated and largest market for Monolithic Ceramics in 2017 while the region is also set to grow faster, compared to other regions, with projected CAGR of 6.8% during the same analysis period. Monolithic ceramics constitute the largest product category within the broader field of technical ceramics and include those ceramics that, as a rule, are not composites. On the other hand, in monolithic ceramics, the interface chemistry, as also the nature of mechanical and chemical bonding established between the two phases can be entirely different from that obtained in ceramic composites. Monolithic ceramics are typified by their special features, such as reliability, durability and resistance to high temperatures, which makes them indispensable in some of the more demanding applications. These ceramics can be fabricated without a reinforcement material and have a polycrystalline microstructure. Much of the demand for Monolithic Ceramics is derived from their extensive use in the automotive, electrical and electronics, power and defense industries. A growing global demand for electronic devices, such as laptops and mobile phones, has been instrumental in propelling the market for these materials. Asia-Pacific’s rapidly expanding electrical and electronics sector has ensured that the region remains at forefront in terms of demand for Monolithic Ceramics. 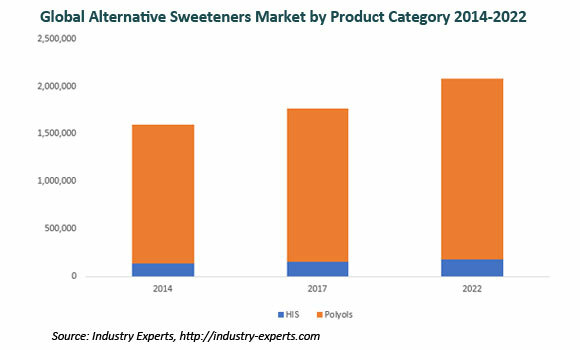 One possible limiting factor to this momentum can be the high cost of processing and excessive requirement of energy that go into obtaining the final product. Some of the other factors playing prominent roles in impacting the market for Monolithic Ceramics include greater use of these ceramics in fabricating turbine blades and other automotive components and stringent pollution control measures being rolled out by developing nations. Worldwide market for Monolithic Ceramics forecast to be US$51.2 billion in 2017 and projected to reach US$67.5 billion by 2022 at a CAGR of 5.7% between 2017 and 2022. 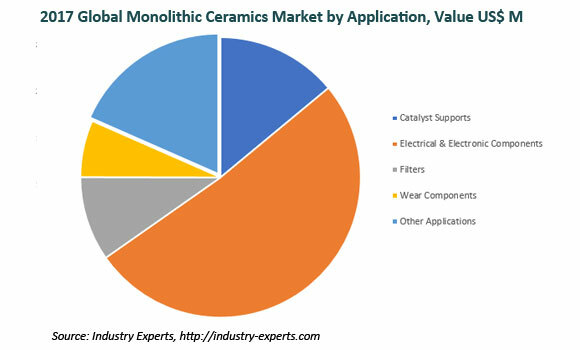 Electrical & Electronic Components lead the global demand for Monolithic Ceramics which is forecast to be US$26.3 billion in 2017 and is expected to maintain a CAGR of 5.7% between 2017 and 2022 and reach a projected US$34.7 billion by 2022. The report analyzes the monolithic ceramic product types comprising Non-Oxides and Oxides. Monolithic Oxide Ceramics’ market further reviewed by its sub-type including Aluminum Oxide and Zirconium Oxide. The study also analyzes the key applications of monolithic ceramics consisting of Catalyst Supports, Electrical & Electronic Components, Filters, Wear Components and Others. The global markets for aforementioned ceramic types and applications of monolithic ceramics are analyzed in terms of value in USD for 2014-2022 analysis period in the global markets comprising North America, Europe, Asia-Pacific, Latin America and Rest of World. The regional markets further analyzed for 16 independent countries across North America – The United States and Canada; Europe – France, Germany, Italy, Russia, Spain and the United Kingdom; Asia-Pacific – China, India, Japan, South Korea and Taiwan; Latin America – Argentina, Brazil and Mexico. The market is analyzed in all of these major regions by key countries, ceramic types/sub-types and by key applications in terms of USD. This 432 page global monolithic ceramics’ market report includes 282 charts (includes a data table and graphical representation for each chart), supported with meaningful and easy to understand graphical presentation, of market numbers. The report profiles 17 key global players and 41 major players across North America – 18; Europe – 8 and Asia-Pacific – 15. The study also provides the listing of the companies engaged in manufacturing and supply of monolithic ceramics. The global list of companies covers the address, contact numbers and the website addresses of 448 companies.